Please note due to the value of the pound these models will increase on the 1st February, Bristol is you last chance to fit your price as shown on the website. New stock of 55H/L H Loveless models, DCC and smoke can be fitted if required. A fully finished version of this stunning loco , this is a limited run of 30 models. supplied fully finished by the factory. Under test samples have pulled 21 brass coaches at a scale 60mph drawing 1amp at 12V. Fitted with the slightly longer drawbar we have run the locomotive and tender in both directions through 4'6"" radius curves. New commission of 55H/L H Loveless models, DCC and smoke can be fitted if required. 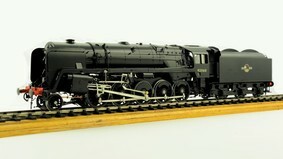 A fully finished version of this stunning loco , this is a limited run of 5 models. supplied fully finished by the factory. Fitted with the slightly longer drawbar we have run the locomotive and tender in both directions through 4'6" radius curves. A fully finished version of this stunning loco , this is a limited run of 40 models, supplied fully finished by the factory. We are making the as running version for 1957-63 so a choice of 2 tenders.